Wrapping holiday gifts can be a boring chore, often amounting to hours spent on the floor in a sprawl of presents, cursing from the paper cuts and somehow always running out of tape (or is that just me?). 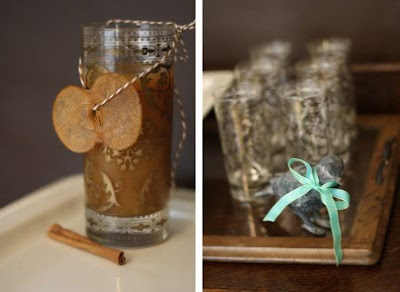 Now turn that chore into a party, and you've got something much more fun and festive. It's hard to feel frustrated when you're sipping a cup of hot cocoa, sharing supplies and creative wrapping ideas among friends. Last weekend, myself and Michele of Cakewalk Baking joined forces in a collaborative effort to bring this idea to life. 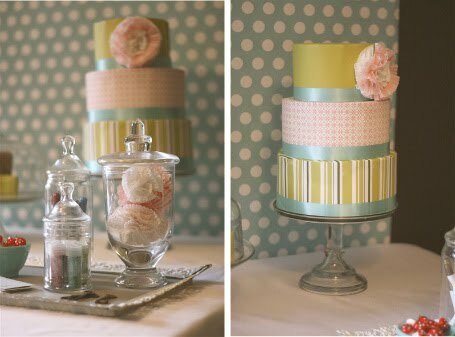 We put a new spin on the dessert table by creating a gift wrap buffet of papers, ribbons, tags and accessories... complete with a paper cake! We chose a fresh winter color palette of blue, green, rose and silver, and I purchased the paper goods from Paper Source to make sure the patterns complimented one another. 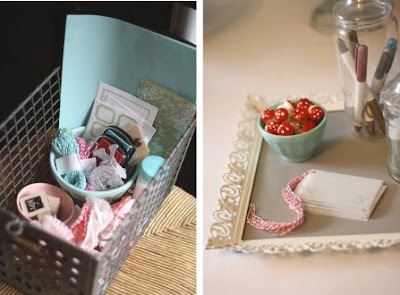 Embellishments included baking twine, cupcake liner flowers, glitter letters, happy tape, antique keys, small mushrooms, metallic markers and a variety of colorful gift tags. 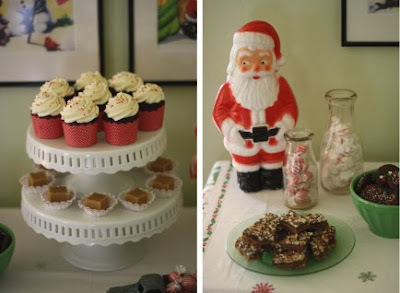 Michele did all the baking and outdid herself with a gorgeous selection of ginger cookies, fudge, white chocolate peppermint cupcakes, and melt in your mouth butter toffee. 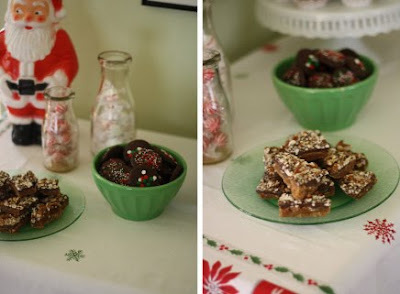 Be sure to check out her blog in the next few days for some of these delicious recipes. 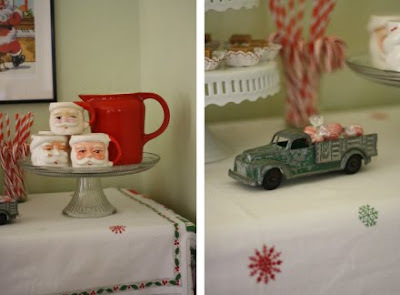 The cake stands and vintage holiday decorations are all part of her enviable personal collection too. 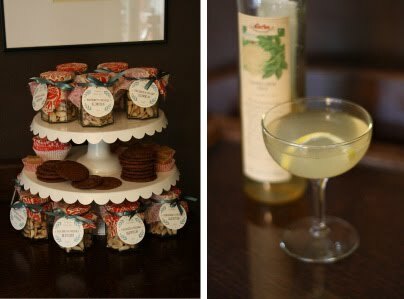 In addition to the sweet treats, we offered an assortment of seasonal beverages including hot apple cider, cocoa and a delicious champagne cocktail- guaranteed to get anyone in the holiday spirit. I created the homemade sea salt & rosemary almonds, packaged in glass jars to take home as favors. The wreath on the tag was a free download from Nonpareil, and I incorporated my own holiday layout and crafted the tags using a circle cutter. See the full tutorial here. It was a perfect December afternoon, and aside from an unfortunate shortage of scissors, a good time was had by all. Perhaps more importantly, we all went home with an item checked off that big holiday to-do list! Love it girl! 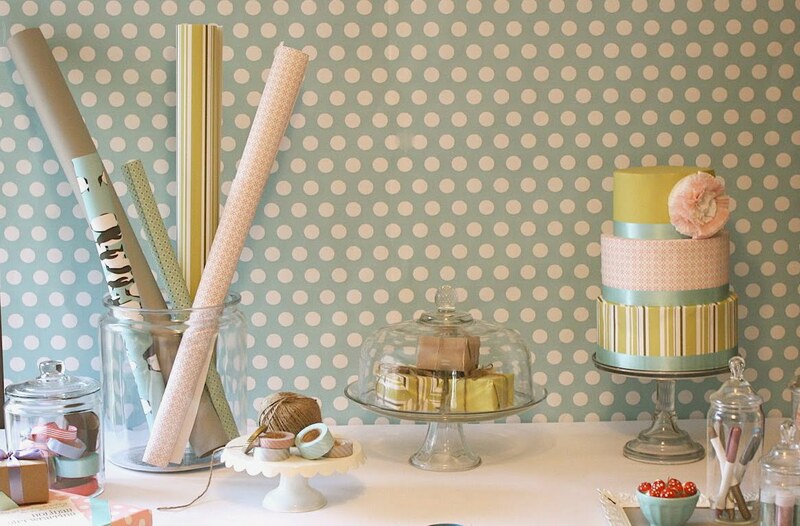 A gift wrap buffet table that leaves no guilt behind! The food looks fab as well! What a fun idea for a party! Everything looks so awesome! So many cute little details in this party. I love it! Would you mind sharing where you found the scallop cake stands (the ones with the jars on top). I have looked everywhere for them. such a great idea! everything looked amazing too...your almonds were the perfect addition! Thank you everyone for the lovely comments. It was so fun to collaborate with Becca on this party! oh my gosh, i love it! what a fantastic idea! 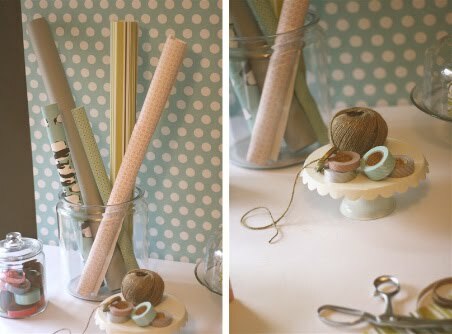 You made everything look so lovely...how could you get any actual wrapping done (and mess up the pretty set-up)? Kudos on a great collaboration! I just LOVE this party theme! What a better way to spend the time wrapping but w friends. 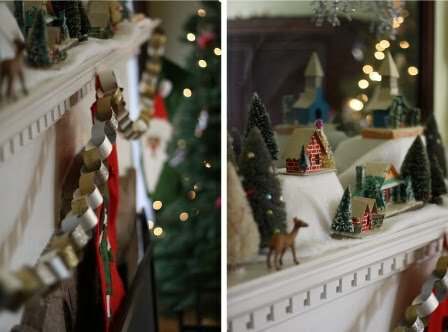 And the decor and details... amazing. I am your newest follower.